Patti Smith’s poetic memoir, Woolgathering, is a miniature portrait of the artist as a young woman. Incorporating poetry and prose as well as photos, Smith’s reissued and augmented memoir, first published in 1992, endeavors to reflect the affecting experiences and observations of the author as a budding young artist. Although probably most well know for her music, the multitalented Patti Smith is a multifaceted artist who is skilled in multimedia. Like Wordsworth and other Romantic poets, Patti Smith adulates the imagination, especially childhood imagination, mysticism or spirituality, dreams, sensations, nature, the sublime and individualism. However, the quality of the writing in Woolgathering is a mixed bag. It consists of spots of brilliance and spots of mediocrity. The balance of her sentences and the lovely images reflect some of Ms. Smith’s best writing. Each line is a cliché or a prefabricated idea and the “chunk of cloud meat” is a stomach-turning image that is linguistically clunky and fails to create a concrete or meaningful image. Patti Smith dedicates quite a bit of space to developing and explaining the elegant and aptly titled memoir, Woolgathering. She reminisces about seeing the woolgatherers at night in a field near her house: “They traced, in concert, the mystery of their work, conspiring in their movements to cleanse and to magnify existence in a song of man. It appeared they were not gathering but giving. . . . They spun their song—a cloth of its own. . . . Ms. Smith is clearly inspired by the woolgatherers and, like them, she spins tales and songs. 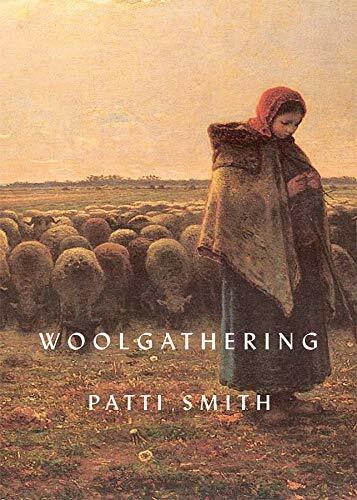 Although Woolgathering includes some nice writing and memorable images and ideas about the making of an artist, the book is geared to and will appeal most to true Patti Smith aficionados. Diehard fans may want to read her musings, impressions and childhood reminiscences, but the disinterested reader is unlikely to be captivated by the uneven writing that can come across as self-important and self-absorbed. Ariel Balter is the author of a memoir, The Maternity Labyrinth. She has taught literature and writing at both the high school and college levels.